FOIMan announces the publication of his new book designed to assist FOI Officers and anyone else to better understand FOI. I’m proud to announce the publication of my new book, The Freedom of Information Officer’s Handbook. Formally released by Facet Publishing on 3 January 2019, it is now available to purchase from online retailers, or from the publisher direct (see the end of this post for details of how to obtain a discount on the cover price as a reader of this blog). a practical guide which takes the reader on a journey through the intricacies of dealing with FOI…It contains everything you ever wanted to know about FOI and in a really easy to read format. the first book which really meets the needs of and challenges facing FOI practitioners. FOI in Practice – exploring the role of the FOI Officer, what infrastructure is needed to support compliance, the stages of handling a request, how to communicate effectively with applicants and a guide to conducting internal reviews and the role of the Information Commissioner. For me, the release of the Handbook on 3 January 2019 marked the culmination of almost two years of hard work, and I’m extremely proud of the finished product. I hope readers will indulge me talking about it over the next few months – as anyone who has written a book will testify, it involves a huge commitment of time and effort. As an author, I’d obviously like as many people as possible to read what I’ve created. In addition though, I wrote this book because I felt that there wasn’t enough support (or credit) given to FOI practitioners. So I hope that at least a few FOI Officers will gain some confidence from the content of the Handbook. And if anyone else reads it, that they will have more respect for, and understanding of, the people who do their best to make FOI work in practice. 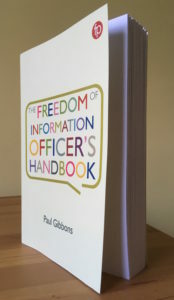 More details about The Freedom of Information Officer’s Handbook, including a full list of the contents, can be found on the Facet Publishing website. You can also read Elizabeth Barber’s and Jonathan Baines’s opinions of the book in full there. 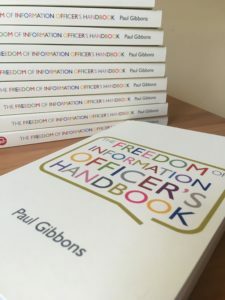 If you would like to obtain a copy of The Freedom of Information Officer’s Handbook, you can get a 30% discount on the RRP of £64.95 (purchasing it for £45.45) by emailing info(Replace this parenthesis with the @ sign)facetpublishing.co.uk, quoting the code FOIBLOG30. Do not supply payment card or bank account details by email. The publisher’s distributor will then contact you to arrange payment and discuss where to send your copy.